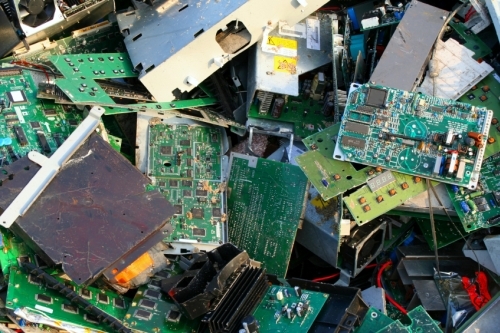 Waste Electrical and Electronic Equipment (WEEE) often ascribed as “urban ore” is a waste type consisting of any broken or unwanted electrical or electronic appliance. It includes includes computers, entertainment electronics, mobile phones and other items that have been discarded by their original users. Presence of chemicals like cadmium, lead, mercury, hexavalent chromium and brominated flame retardants makes e-waste dangerous. Electronic equipments are major contributors of heavy metals and organic pollutants to the waste stream. The Central Ministry of Environment & Forests (MoEF) of the Government of India now considers it necessary to enable the recovery and/or reuse of useful material from WEEE, thereby reducing the hazardous wastes destined for disposal and to ensure the environmentally sound management of all types of waste electrical and electronic equipment. In this regard, the MoEF has notified the Draft E-Waste Handling & Management Rules on 30th March, 2010. The rules may be called the E-waste (Management and Handling) Rules, 2010 and shall apply to every producer(s), dealer(s), collection centre(s), refurbisher(s), dismantler(s), recycler(s), auctioneer(s) consumer(s) or bulk consumer(s) involved in the manufacture, processing, sale, purchase of electrical and electronic equipment or components. To whom the rules shall not apply is clearly listed in the draft notification. The draft defines the responsibilities of each of the handlers of components that will eventually add to the E-waste load. NextBhaiyaa aal izz NOT well, Aree chaachu all izz NOT well AT ALL! INDIA IS A DEVELOPING NATION AND HAS OBSERVED A SUCCESSFUL PROGRESS IN MOST OF THE CASES…….SO I FIRMLY BELIEVE THAT IT’D CERTAINLY BEAT CHINA IN HOSTING THE COMMON-WEALTH GAMES. ITS THE PRIME RESPONSIBILITY OF EVERY INDIAN CITIZEN TO ACT UPON THE REAL RESOLUTIONS………………..
Really good job from the Indian government on E waste habdling. RoHS and E wsate handling are clubled together.